The 2017-18 NBA Most Improved Player keeps getting better. Indiana Pacers guard Victor Oladipo, who earned that honor last season, hit a 3-pointer with 3.4 seconds left to give the host Pacers a 102-101 victory over Boston Saturday night. Entering Monday night's game with Houston (3-5) is averaging points for Indiana (7-3). "That really reminds me of shot he hit last year," said Pacers coach Nate McMillan, whose team has won three in a row. "It was a close ballgame and he pulls up and hits a 3. But very similar shot he took (against Boston). It just gave him confidence throughout last season to believe in himself. He now believes in himself. He wants that shot. He didn't hesitate." Oladipo grabbed the rebound, paused for a second to see if McMillan was going to take a timeout. "I was reading it," Oladipo said. "When I saw them pick me up pretty high. I just got to my spot and then shot the ball with confidence." 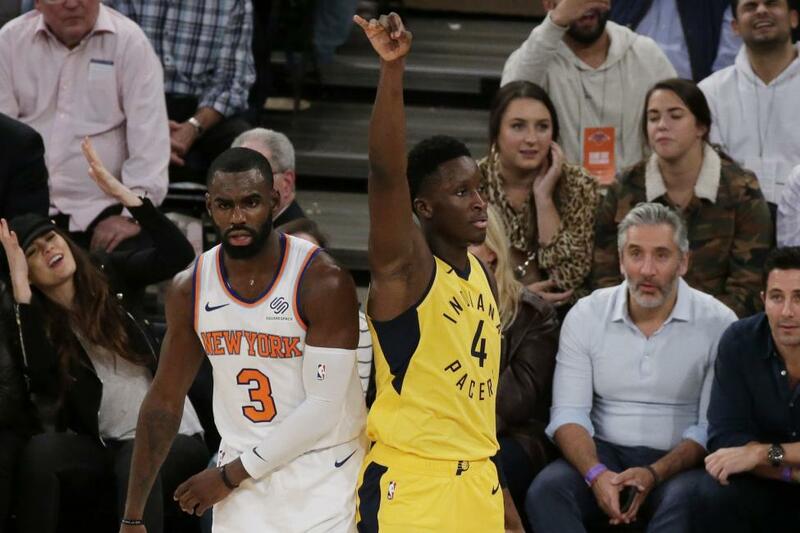 Oladipo, who has been battling bronchitis for the past several days, then got a steal to seal the game. Domantas Sabonis, who was traded to Indiana from Oklahoma City with Oladipo before the '17-18 season, has watched Oladipo's growth. "His confidence level is at a really high point and he's just amazing," Sabonis said. "Last year he did it many times and this year he keeps getting better and better." Oladipo, who is averaging 22.5 points and 7.3 rebounds, had 24 points and 12 rebounds against Boston, his second consecutive double-double. Meanwhile, the reigning MVP is coming to town. After missing three games with a strained left hamstring injury, James Harden returned to score 25 points in a 96-88 victory over host Chicago. "Just playing a full game, contact and all that," Harden said. "I felt like it's been a minute so I just wanted to get out there and try to be myself." Harden said he had too many turnovers. That will improve once he gets his rhythm back, Harden said. "Once we get a full user and get guys into rotations and comfortable, sky's the limit for us," Harden said. Rockets guard Chris Paul said it was good to see Harden return. Paul said the key will be to keep getting bodies back. Against Chicago, the Rockets were without injured guard Eric Gordon. Gordon, an Indianapolis native, has been ruled out for Monday's game as well with a strained right adductor. The Rockets have used five different lineups in eight games. "For us, it's about building, but we've got to pile up some wins," said Paul, who was suspended for two games for an altercation with the Los Angeles Lakers last month. "Regardless of how it looks right now, we've just got to get some marks in the left column." Trailing the Bulls by two points at halftime, Houston held a 21-7 edge in third quarter. Houston forward Carmelo Anthony said the second-half showing was key for the Rockets. "Any time you can take it up another level coming out of halftime that's key," said Anthony, who is averaging 15.5 points. "These last two games we've been doing that. The good teams and great teams are very good at coming out of halftime, these past two games we've shown how good a team we can be."